Sometimes a ride takes you to a place that is simply magical. You almost start laughing because what you are riding through is so spectacular and you feel unbelievably lucky that the forces that govern the universe have allowed you to be right here, right now. 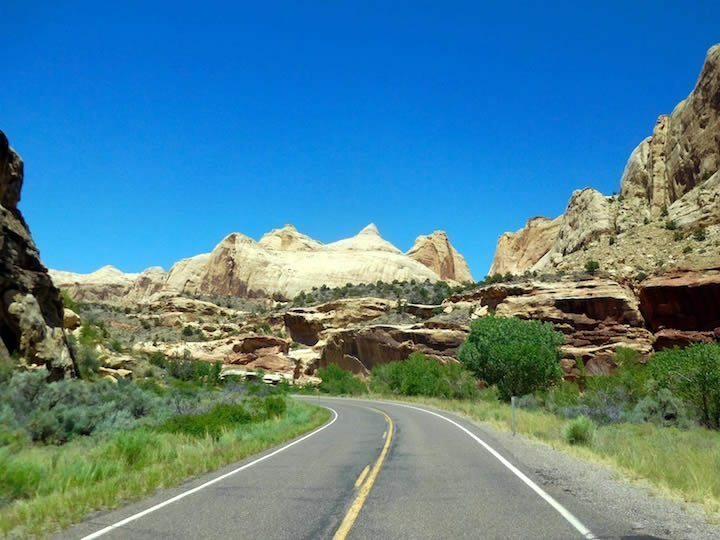 This is Capitol Reef National Monument. 78 degrees, a 45 mph speed limit and for a change you are traveling 10 mph below that to let all this soak into you. 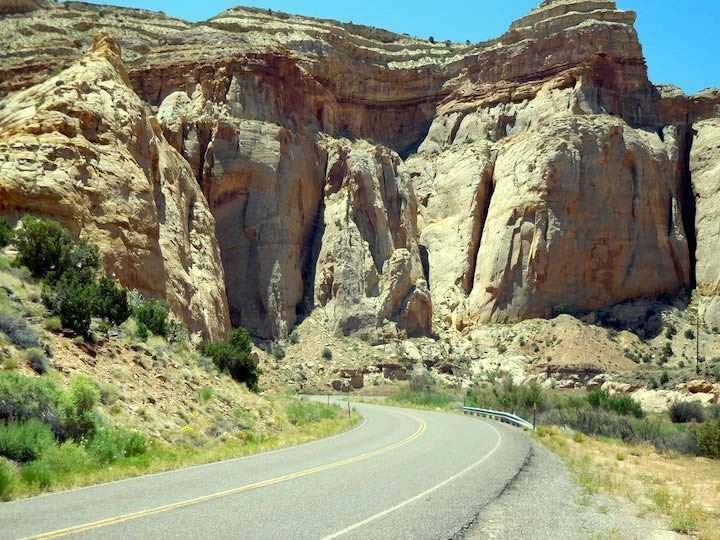 The helmet and jacket are packed away and in a t-shirt, jeans and bandana you cruise through this canyon. 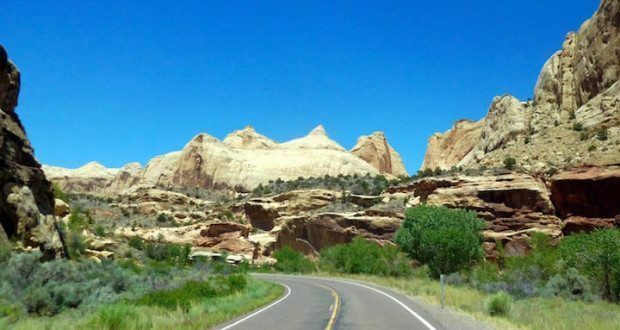 It’s no wonder the Ancient Puebloans lived here for 800 years. 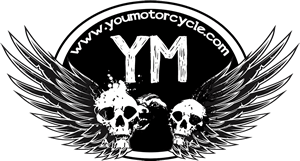 EDITOR’S NOTE: If you haven’t already, please see Part 1 of Jefe’s Colorado Motorcycle Ride. 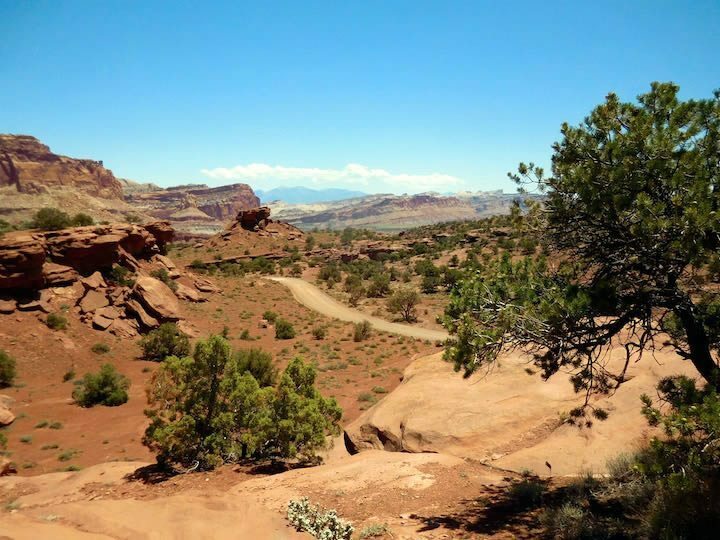 This last pic is from Grand Staircase Escalante National Monument just below Capitol Reef in southern Utah. 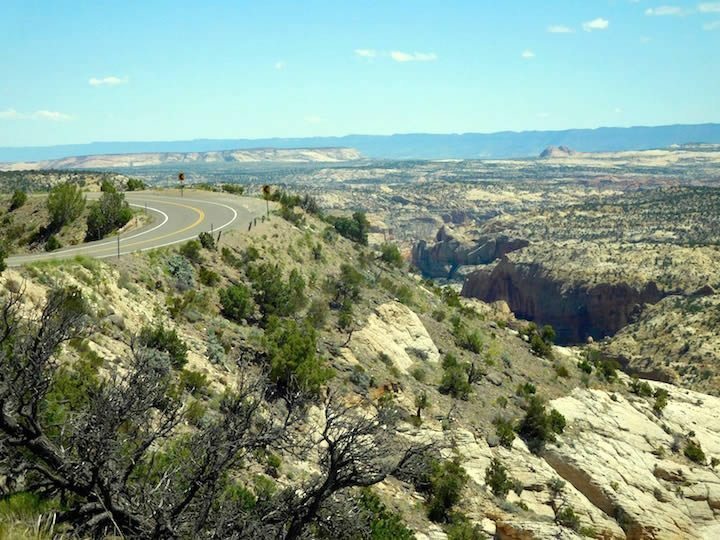 This two mile section of road runs along a ridge top with 1000 foot drops on both sides. No guard rails. This earth has existed for billions of years. Man may exterminate himself with climate change, a nuclear holocaust or serial reruns of The Simpsons, but these places will be around to welcome the next residents, maybe insectoid or other humanoids millions of years in the future. Maybe they will find a fossilized skeleton next to some iron and aluminum dust and a few preserved plastic parts from a motorcycle buried in rock formed under the next inland sea that covers these areas. It would be nice if humans could evolve to being less warlike, more spiritual creatures and stick around to enjoy this place for a long time, but I am not confident. We have made monstrous technical advances and minimal societal advances in the 10,000 years modern man has dominated the planet. We have a long way to go to prove ourselves worthy of this planet we inherited. Jefe Smith continues to ride across America, 140,000 miles in the past 12 years. 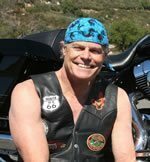 His irreverent storytelling of road experiences, life experiences and the America he discovers can be accessed in his first book, LIFE, AMERICA and the ROAD A Biker’s Perspective, which has been well received by the motorcycle community. The ebook is available in the Amazon Kindle Store and signed hard copies are available at jefestours.com. A second book, LIFE, AMERICA and the ROAD to KEY WEST A Biker’s Perspective is out now!